North Coast Journal - September 18, 2003: ART BEAT - "Inharmonious"
I can't exactly remember when I first heard about the mural, but I do recall, quite clearly, when it became The Mural with capital letters, and I really started to pay attention. 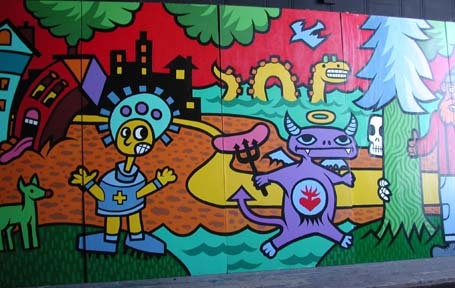 It was at a party in August, when someone told me in passing that a mutual friend on Eureka's Design Review Committee had to tell Duane Flatmo they had voted down his proposal to install a mural on a building on the corner of Fifth and F. Uh-oh, I thought at the time. This could get a little sticky. 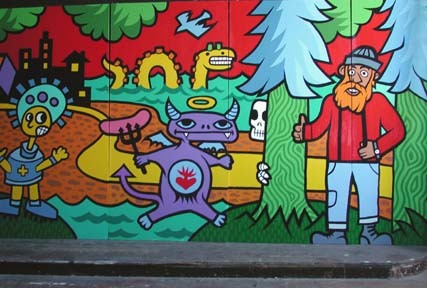 The mural I'm referring to is a completed, multi-paneled piece, the most recent project by the Rural Burl Mural Bureau, a highly respected Ink People program geared toward "at risk" teens, founded by Duane 10 years ago. At the time of the party, I hadn't actually seen the mural myself, so I obviously wondered what Design Review's objection was about. I went to Duane's house a few days later (to interview his wife Micki for another column) and asked him about the decision. Duane said the committee had declared his piece "inharmonious with the surrounding buildings" in that particular neighborhood and "not consistent with [Eureka's] Victorian Seaport" theme. Their recommendation to the Planning Commission was to reject it for that location. He showed me a pencil layout of the piece and said the committee was disturbed by several "menacing" visual elements, including red-eyed aliens, a robot with a chainsaw arm, and a skeleton peeking around a redwood tree (which Duane says is a tree-hugger who's been there for a really long time). Duane explained that the characters were created by the kids in his mural program, inspired by their personal experiences and surroundings. He had traced and enlarged their drawings and created an environment for the characters to live in, making the mural a true collaborative effort with the kids. He said he planned to appeal Design Review's decision at the Planning Commission's next meeting. I should probably take a minute here to note that coming before Design Review is a fairly routine step in the city's planning process. Any planned alteration to the exterior of a building in the redevelopment district has to be reviewed by the committee, which has just three voting members: Director of Community Development Kevin Hamblin, building official Michael Knight, and Charlene Cutler-Ploss, who was appointed by the City Council. If Design Review doesn't recommend a project, an applicant can modify their plan and/or plead their case to the Planning Commission. If the plan is again denied, the applicant has the option of taking it to the City Council. That second step turned out to be unnecessary in Duane's case, however, because on Sept. 8, the planning commissioners ignored the committee's recommendation and voted to let him proceed with his plan to hang the mural on the side of the Dalianes travel service building on F Street. I couldn't make it to the meeting myself (I was busy holding my new grandbaby in San Diego) but friends who attended filled me in on the details. Ann White, a local painter and printmaker who routinely attends city meetings (due to her passion for saving old buildings), says the planned mural generated a respectful and constructive debate about how to determine whether a piece of public art is or is not a "harmonious" addition to a given neighborhood. Ann says that even though she felt Design Review made an appropriate recommendation based on Eureka's municipal code (which states that "the ugly, inharmonious, the monotonous, and the hazardous shall be barred"), she stood up as an artist and spoke in favor of the mural because she believes in the principle of "art for art's sake." So, here's the question: Should public art be judged by the same criteria used to evaluate other elements in a cityscape? Unfortunately, telling an artist his work is inharmonious with its surroundings sounds a lot like saying it doesn't go with the couch. I don't know why, but artists really hate that. 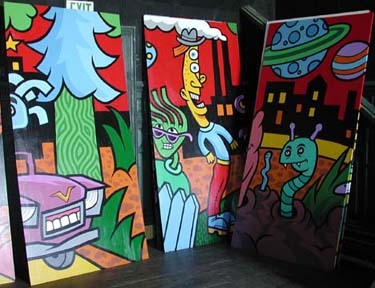 We like thinking that art should be the focal point of an environment, not the other way around. Buy another damn couch, most artists would say. "F Street corridor" is another big deal, because it provides the link between the new boardwalk and the Morris Graves Museum (or Old Town and downtown). I talked to several people who had seen the mural, or at least pictures of it, and was surprised by how many of these folks agreed it was "inappropriate" for that location. While everyone insisted they love Duane's work and vigorously support the mural program, some thought this particular piece should go somewhere else -- like maybe the high school or the youth center. One person told me the mural reminded her of the kind of art her son used to produce when he was a difficult teenager, a period she didn't especially want to be reminded of. Well, obviously, I would need to see this controversial piece for myself. I arranged to meet my editor Bob Doran at the site where the mural is being stored (upstairs in the Lost Coast Brewery building) so he could take pictures of it for this story. Duane's friend, fellow artist Ken Beidelman (who lives with June Moxon on the third floor) let us in. I can't even pretend to be impartial here, since I'm crazy about Duane and his work, but the nutty characters and bright, graphic colors just tickled the hell out of me. 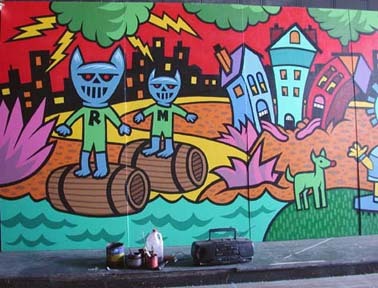 I asked Bob if he thought there was anything menacing about the mural. We discussed those red-eyed aliens, the robot armed with a chainsaw and an eggbeater, and the yellow lightning bolts coming out of green clouds in that red sky. Ken Beidelman looked at us like we were nuts. "Here's the thing," he said. "It isn't real." Well, yeah. There is that. Anyway, the more we investigated the stacks of gigantic panels, the more we discovered. Why is that hitchhiker's skin painted green? Is she an environmentalist? And how about that mutant creature -- is he standing in front of the pulp mill for a reason? 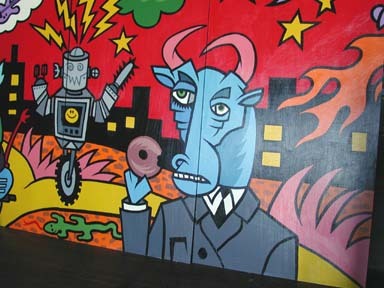 Why is that blue-headed bull in the business suit eating a bagel? It kept us entertained for a long time. Every morning when I'm walking my dog past the Dalianes building on the way to the boardwalk, I try to imagine the mural up there. I can hardly wait, but that's just me and I'm biased. All I can say is, I'm glad I'm not the one who has to decide where a piece of public art, the most subjective of all the visual elements in a cityscape, should or shouldn't be hung. I have a hard enough time deciding which paintings to hang in my living room.